Here comes the sun. Baby daylight is yawning herself awake, stretching like a blinking blue-eyed kitten into a brand new year. Little by little we are inching ever so nonchalant toward Groundhog Day, toward snowdrops poking through the crust of winter snow, toward pink horizons and bird calls. But I am not bothering to count the days of winter. And I am not bothering to count calories. I am lingering in my passion for comfort food. For baking. For muffins. In between bowls of vegan detox soup. Because I know the deal. I know my body's cycle. I understand that I slow down in winter. I hibernate. I conserve energy. Translation: I put on a few pounds. I have evidence to prove it. But I no longer panic. I have danced around this yearly cycle a time or two. Well. More like fifty-two. Plus five. But who's counting? I dream instead. Of romance. Of ease. Of psychic room to breathe. I imagine an early spring and the scents of almond and orange come to mind- not for any particular reason or culinary logic. It's just whimsy. Or maybe it's because the sweet breezy taste of citrus feels bright and refreshing after all the dense flavors of the season, like pumpkin streusel and cranberry and sweet potato. I ponder iPhone photography apps and process images for Instagram while I stir gluten-free flours into muffin batter (I multitask my yearnings). Truth is, I follow my cravings. And I honor them. Most of the time. Which sometimes means ignoring them, frankly (cocktail hour can be one long nightmare of an hour, especially in the grip of Midwinter). And sometimes honoring means listening to cravings. Acknowledging them. Validating them. Then grabbing them by the scruff of the neck and plunking them onto the Time Out chair. And going for a walk- to let them sulk in silence. 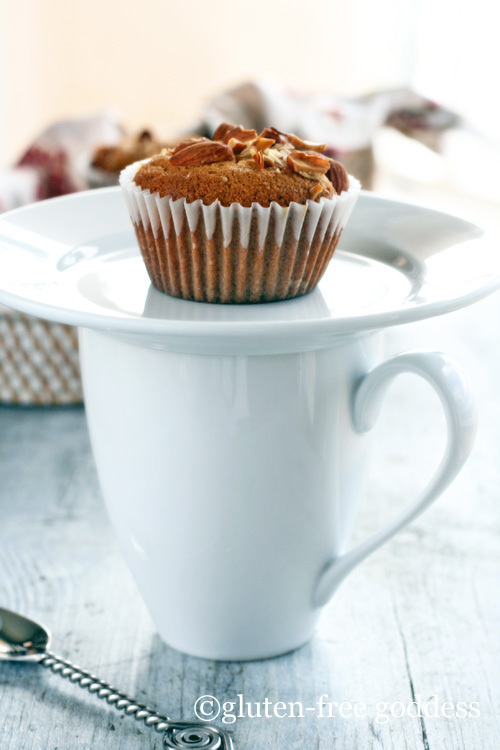 But sometimes a craving is as simple and true as a muffin. A gluten-free muffin, thankfully (Goddess knows I lost my taste for wheat years ago). And in the grand scheme of things, a muffin is one craving I can live with. I take things one kitten-blinking day at a time. 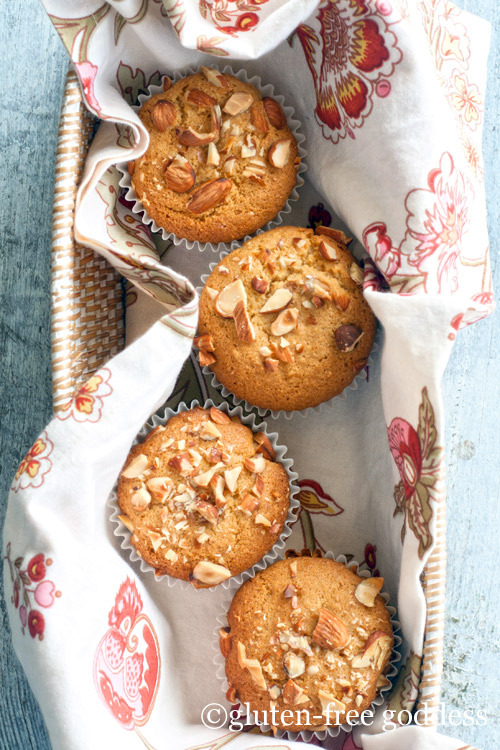 This easy vegan muffin recipe is gloriously free of eggs, dairy and gluten. I whipped up these lovely gems on Sunday for a light brunch treat. Fab with a mug of hot tea. Preheat the oven to 375ºF. Line a twelve muffin tin with paper or parchment liners. In a large mixing bowl, whisk together the dry ingredients- the sorghum flour, almond meal, starch, brown sugar, baking powder, xanthan gum and salt. Make a well in the center and add in the brown rice syrup, orange juice, and vanilla. Stir to combine and beat until until smooth and sticky. Vegan batter relies on the acid in the orange juice to activate the leavening. The brown rice syrup helps to moisten and bind the batter. Stir in the chopped roasted almond pieces, saving out a few for the tops, if you like..
Drop the batter into the muffin cups by spoonfuls- or use an ice cream scoop to distribute the batter. Smooth out tops with wet fingers. Sprinkle with the remaining roasted almond pieces. Bake on the center rack for 17 to 23 minutes, depending upon your oven. A toothpick inserted into the center should emerge clean. The tops are firm and slightly springy to a light touch. Cool briefly, then gently turn the muffins out of the pan on to a wire rack to continue cooling. Or enjoy tender and warm with a slather of vegan buttery spread or soy cream cheese. These easy wheat-free muffins are egg-free and vegan. But if you prefer using eggs, I'd try two beaten free-range organic eggs. Use two tablespoons less orange juice. I wouldn't change anything else. Watch the baking time on these- if your oven runs hot- they may cook faster. If it runs cool, you may need to add on a minute or two. When necessary, I find that brown rice flour and sorghum flour are interchangeable in my muffin recipes. However, white rice flour is not recommended; it is inferior in texture and flavor. 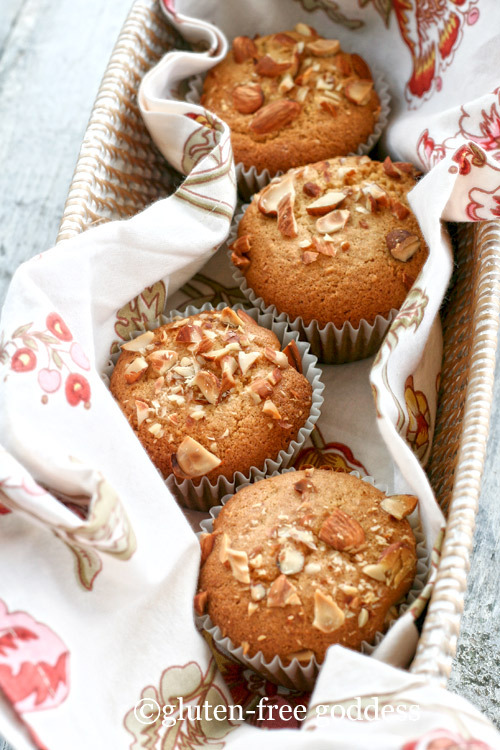 GF brown rice syrup adds lovely flavor and moisture to these muffins. But if you prefer using honey, it will work. Agave will also work. Maple syrup will add a mild maple flavor, and not bind or moisturize quite as well.